A website and a press release aren’t enough to announce a find to the scientific community–a proper technical paper is absolutely necessary! The process is a long one, but it helps to ensure that only the most accurate information about “Joe” is distributed. It took around a year to write up the research paper, which provided a detailed, precise description of every aspect of “Joe”‘s anatomy, as well as interpretations of what this anatomy means. Draft after draft was edited and revised, with each author spending hours carefully crafting the text and illustrations. All together now! 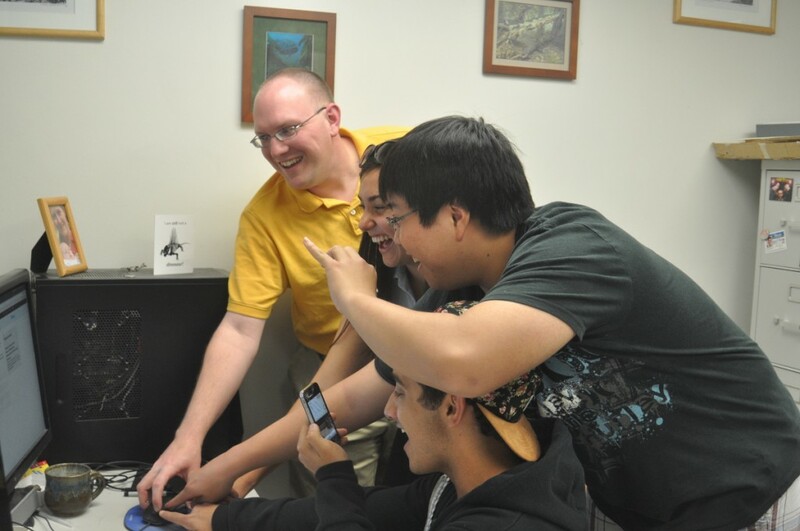 Project co-authors (from left) Andy Farke, Annisa Herrero, Derek Chok, and Brandon Scolieri (bottom) press the button to submit their paper on “Joe” for peer review. Co-author Sarah Werning was up in Berkeley at the time, so she couldn’t make it for the picture. It was an exciting day when the authors learned that their paper on “Joe” was accepted for publication! The staff at the journal formatted the paper, turning it from raw figures and a word processing document into a visually pleasing publication. The peer-reviewed scientific paper on “Joe” was published in the journal PeerJ on October 22, 2013. Are you interested in checking out the scientific publication? You can read it for free at PeerJ! The paper is open access, meaning that is is freely readable and usable by anyone, anywhere in the world!